After its projects to change Indian history to 'secular' history, the United Progressive Alliance govt seems to have launched a project to make the army 'secular'. The Indian Army is an apolitical, professional body that is extremely proud of its dharma of loyalty to the nation and its Constitution. It does not believe in practising discrimination on the basis of religion, caste or colour. I felt a tremendous sense of pride when at an Independence Day function in Pune in 2002 (in the aftermath of the horrible Gujarat riots) Qutubuddin Ansari, the tailor from Ahmedabad who became famous as the face of that tragedy, told me it was the Indian Army's timely arrival that had saved him and his family. In an emotion choked voice, he said throughout his life he would pray for the success of the Indian Army. Many officers and men have told me how Muslims greeted the army's arrival by showering them with flowers. The army's impartial conduct in quelling riots is a matter of great pride to all soldiers. The Indian Army is a traditional force and many battalions are organised on the basis of regions and caste. Thus we have the Sikh regiment, the Marathas, the Gorkhas etc. But this does not apply at the officer level. So it is no surprise to see a Mohammed Zaki commanding Garhwali troops or a Y N Sharma as commanding officer of the Grenadiers(which incidentally has Muslim soldiers). As head of the family, which is what a commanding officer is, it is common for Zaki to conduct the puja on Janmashtami, celebrating the birth of Lord Krishna, or for Sharma to lead the namaz on Id Ul Fitr after Ramzan. 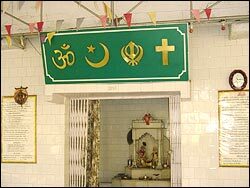 Faced with an insurgency in Kashmir that freely uses religion as a motivating factor, the army has has constructed combined prayer halls, called Sarva Dharma Sthal ( All Religion Place of Worship) where you have all the gods and symbols of all religions under one roof. These can be found at in Anantnag in Kashmir and even in Pune. It is undoubtedly true that the number of Muslims in the Army is less than their proportion in the population. This is a historical legacy as the recruitment of Muslims in the armed forces in pre-Independence India was concentrated in Punjab, North West Frontier and Balochistan, all part of Pakistan today. A similar argument can be also made on the basis of region. The states of Orissa or Gujarat or even Andhra Pradesh are not represented in proportion to their population. To assume any bias on this basis is to see evil where none exists. The all-wise Sachar Committee has initiated an exercise that is fraught with great danger as it hits at the very notion of fair play. The basis on which this exercise is being carried out is a book by an American citizen, Omar Khalidi, (Khaki and Ethnic Violence in India). Khalidi works at the Massachusetts Institute of Technology in the United States. As a matter of record, he had got in touch with me about two years ago seeking data on the Indian Army. It is another matter that seeing his intention, I and my colleagues refused any cooperation. But he obviously has won over Sachar and party. What every soldier finds most objectionable in the exercise is Sachar's notion of equating the armed forces with any other department of the central government. Could Mr Sachar please tell us in which other organisation is dying for the country part of the 'job'? The committee also had the gall to say that the army made 'unnecessary fuss about this on grounds of regimental spirit and cohesion.' Do the Sachar committee members realise that the two factors -- regimental spirit and cohesion -- are the very soul of any army? These are the factors that bind soldiers and officers to each other. People sacrifice their lives on the battlefield for the izzat (respect) of the regiment and save their comrades at the risk of their own lives. Without these an army is merely a mob of armed violent men which would melt at the first sign of danger. When someone terms this as 'frivolous', it betrays a mindset that is not merely stupid, but dangerous. Finally, a word about desertion during Hyderabad action (in 1948-1949) and Turtuk problem during the Kargil operations in 1999. During the Kargil operations, the small population of Turtuk area was a complex issue. This area, right till 1971, was part of Pakistan and was captured during that war. The area had many ex-soldiers of the Pakistani army, still receiving pension. To expect them to become pro-India was not fair. So what was proposed (possibly) during the Kargil war, was not evacuation of Muslims, but evacuation of ex-Pakistanis from a sensitive battle zone. Are there any such reports regarding the Muslim population of Kargil, Dras etc? Many former and serving soldiers believe that this data collection is the thin end of the wedge of introducing religion or caste-based reservations in the armed forces. The Sachar Committee's bias has been clearly shown by their reliance on foreign research. It is time the government prohibits the Sachar Committee from dealing with the armed forces. This does not mean that the government should not ask the army to conduct an exercise as to why the proportion of Muslims or Christians or Gujaratis is less in the armed forces. Finally a counter question to the Sachar Committee: What is the proportion of Muslim employees in Muslim-owned companies like Wipro and Cipla? If it is less than their proportion in population, do we take it that the Muslim owners of these companies are also against the minorities? Is there no limit to 'vote bank' politics, for the sake of which a government is prepared to destroy the efficiency and cohesion of its armed forces and jeopardise the nation's security?